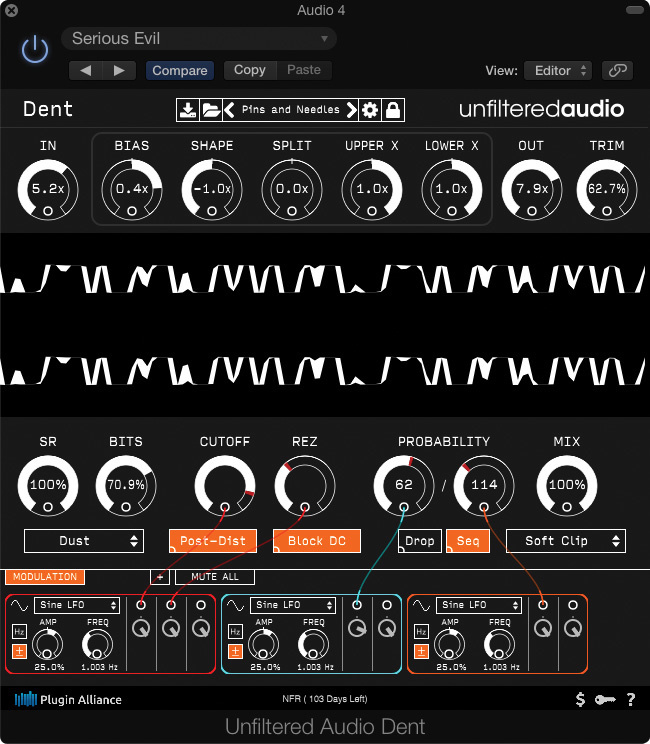 Unfiltered Audio’s Dent is a comprehensive set of tools specifically designed to cause severe damage to your audio waveforms, with a resonant low-pass filter that can be assigned before or after the distortion. It allows pretty much any relevant parameter to be modified dynamically via a comprehensive modulation section that can, if required, follow song tempo. 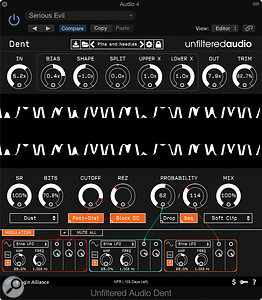 Dent employs a similar layout to Unfiltered Audio’s Fault plug-in, where the modulation sections are added at the bottom of the screen and then their outputs dragged to cable them to their target controls. Once an output is used, another appears. A waveform display occupies the centre of the screen to give an indication of the damage done — most obvious when viewing a sine-wave input. Up to six multi-output assignable modulators can be routed to any relevant controls so, for example, the filter can be modulated to produce rhythmic sweeps or steps, or the character of the distortion can be made to change in time with the music. These modulators can generate sine, sawtooth/triangle or square-wave LFOs, and there’s an input envelope follower, synth-style sample & hold noise for random steps, and a macro control knob. Looking a bit more closely at the instruments of destruction, there are six different bit-crushing algorithms, four flavours of clipping (Hard, Soft, Wavefold or Overfold) and variable Bias, which causes the audio to splutter to extinction at low levels, plus a Split control that adds a DC offset to the positive and/or negative halves of a waveform. The Upper/Lower X control can independently adjust the amplitude of the positive- and negative-going parts of a waveform or even invert them while Shape progressively squares off waveform peaks. All the main waveshaping tools are arranged above the waveform display, with the bit/rate reduction and Probabilistic and Sequential Waveset step-sequencer controls below. These step-sequencer sections are able to forge rhythmic patterns from the distortion character in a rather unusual way. Waveset distortion was invented by composer Trevor Wishart, and defines a waveset as three zero-crossings of a signal: the waveset of a sine wave, for example, would be one complete cycle. The Probability section then determines whether any individual waveset will pass through Dent’s top-row distortion path or not. When Seq mode is switched off, the Probability control alone decides the chance of each waveset being processed, making it essentially random. When Seq mode is on, two Probability controls in effect determine how many consecutive wavesets are processed in a row. For example, if the first knob is set to 4 and the second knob is 16, then the first four wavesets out of each 16 will be distorted, while the remaining 12 are left unprocessed. When Drop is active, those wavesets that escape processing are silenced, so targeting any of these controls from a tempo-related modulator creates interesting rhythmic patterns. Clearly, wavesets will occur more frequently (and have a shorter duration) as the frequency is increased. Some auto-panning effects are also created when the waveset sequencer is in Drop mode on a stereo source. All the controls have a white area to display their manual setting, with the modulation range shown in red. Modulation sources can be applied positively or negatively, and tempo sync can be turned on by clicking the Hz button, which then switches to a musical note icon. There are 16 automation slots assignable to one or more modulation parameters; all the knobs and buttons on a modulator can be assigned to one of these automation slots, which can then be controlled via a single lane of DAW automation. That’s a lot to take in, so the best way to see what these unfamiliar processes actually sound like is just to feed in some audio and twiddle the knobs — mere words don’t suffice to describe the sonic mayhem that can be conjured up! You can also learn a lot by looking at how the presets are made up. You can actually get some fairly subtle sounds by being very cautious with the controls, but pulsing destruction is what Dent does best. The distortion types range from conventional clipping, via bit-reduced, aliasing-infested nastiness to an out-of-tune AM radio or a broken fuzzbox. A clean guitar can be reduced to the sound of stirring broken glass, escaping steam or walking on gravel — there’s almost no limit to the nastiness that can be achieved. However, these effects really come to life when you add modulation to the various parameters, taking you from fuzzed auto-wah guitar to gritty drum-loop reshaping. And the unpleasant things you can do to a polite synth pad don’t bear talking about! This degree of sonic surgery isn’t for everyone, but is a gift for anyone doing experimental, EDM or industrial-style composition, so get the demo and take it for a spin. Just handle with care!